Brian Solis is principal analyst at Altimeter Group, a research firm focused on disruptive technology. He’s also a digital anthropologist and futurist who studies and the effects of emerging technology on business and society. It’s pretty easy to get caught up in tech these days. It’s part of our life now and in many ways, it is our life. Obviously, if you didn’t care about what’s new or what’s next you wouldn’t be here. This is The Next Web after all. The thing about next tech though is that it’s not only inevitable, it’s also incredibly disruptive…or at least it could be. Social, mobile, cloud, real-time, and everything around it, it’s not only affecting and shaping our way of life, disruptive technology is changing how we work and do business. And it’s really just the beginning. Over the last several years, I’ve concentrated my research solely on disruptive technology and its impact on business. At the same time, I’ve explored how technology is disrupting behavior. What’s the difference between disruptive tech and that of emergent or innovative technology? Disruptive tech does just that. It disrupts markets and introduces new direction and/or changes behavior. And thus, we enter an era of “Digital Darwinism,” a time when society and technology evolve, challenging how businesses adapt (or don’t). Last year, I set out to better understand how digital technologies are impacting customer behavior and in turn, learn how businesses are responding to these changes. The results were just published, “Digital Transformation, Why and How Companies are Investing in New Business Models to Lead Digital Customer Experiences.” You can download the report here. Digital transformation is a result of businesses seeking to adapt to this onslaught of disruptive technologies affecting customer and employee behavior. As technology becomes a permanent fixture in everyday life, organizations are faced with an increasing need to update legacy technology strategies and supporting methodologies to better reflect how the real world is evolving. The need to do so is becoming increasingly obligatory. Through a series of interviews with digital strategists and executives at some of the world’s leading brands, the findings shared in this report represent important trends and goals in digital transformation that benefit all businesses and also entrepreneurs seeking to adapt to or lead digital markets in meaningful ways. Believe or not, a research report studying digital transformation, ended up focusing more on the human side of business change as a result of disruptive technology. Doing so allowed me to see the catalysts that drive people to lead change from within, the challenges these companies and also change agents face, and the benefits they are starting to realize. Digital Darwinism today is defined by what I call the “Wheel of Disruption.” It represents some, not all, of the most significant catalysts affecting business as usual today. Facebook, Twitter, Snapchat, WhatsApp, wearable, mobile, the cloud, these are representative of some of the current trends impacting business and society today. It’s how businesses respond that contributes to how they fair in an era of digital Darwinism. Sometimes just looking at technology though is inconclusive, misleading or both. Jumping into trends because they’re trendy isn’t the same as identifying opportunities and ways to create tangible and mutual value. Look at what’s happening on Facebook today as brands complain about Facebook’s algorithm and the need to pay for attention. Sorry brands. Facebook was never a captive database to talk at or entertain masses at will. A Like was never an “opt in.” Building communities that offer meaningful engagement at every stage of the customer lifecycle, in each moment of truth, not just marketing and branding, is how businesses will survive digital Darwinism. 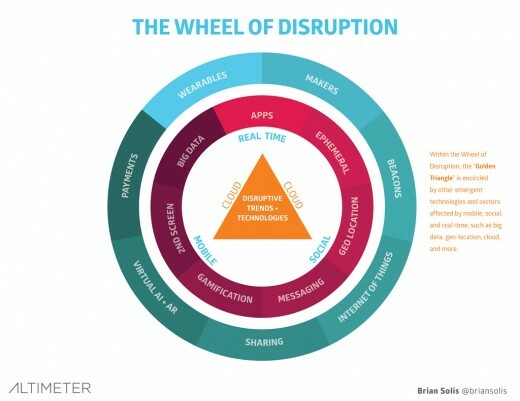 Let’s take a closer look at the Wheel of Disruption, which has since been updated since its debut in What’s the Future of Business. 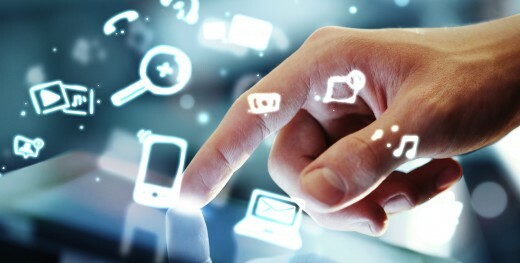 In the center is the “Golden Triangle,” of Social, Mobile and Real-Time surrounded by the Cloud. The Golden Triangle is encircled by other emergent technologies and emergent trends affected by mobile, social, and real-time, such as big data, geo-location, and more. Yet again, for businesses to thrive let alone survive, social, mobile, and real-time strategies are not enough in isolation. These disruptive technologies are merely just the beginning of a still shaping era of connected consumerism. Each in its own right is significant affecting how business is done. But customer behavior and expectations, and that of employees for that matter, continue to evolve. And, the list of disruptive technologies that’s pushing business leaders and processes out of their respective comfort zones is far more exhaustive and constant. When we stop chasing trends and fighting for technology and marketing strategies in the moment, we can appreciate that our view of technology and its aggregate impact on markets is far more massive that we initially realized. Instead of reacting to technology trends at departmental levels, some progressive, brave and tireless strategists (aka change agents) are investing in a more comprehensive campaign of digital transformation. The goal is to invest in informed models that help businesses recognize opportunities, overcome challenges, and make decisions to stay in step, if not ahead of digital customers. Digital transformation is in fact, the next big thing in customer experience and ultimately how business is done. One of the most interesting things I found in this research is that you and I get the fact that technology is affecting us in varying ways. Yet, when we actually go to work, we become part of the machine that conducts business as usual, still seeing people the way they’ve always been. It’s almost as if we plug into a code of doing things a certain way because that’s just the way it is or the way it’s always been done. They’re seeking answers to “what if” What if we did things differently? What if we saw customers for who they are and who they’re becoming, not who they were? As simple as these questions seem, they are incredibly difficult to answer. They tend to go against the culture of how things are done today. But, there are those though who see things for what they could be and start by asking different questions to find the answers that pave a new way forward. The road to digital transformation is far from easy, but it carries great rewards for businesses and customers alike. While digital transformation is developing, there are many roles needed to manage how businesses recognize the opportunities to change and also help lead the efforts to do so. Digital transformation represents a mantra for earning relevance and establishing leadership in a digital economy. Everything begins with understanding the considerable differences between traditional customer strategies and those required to engage and nurture relationships with digital customers. Those companies that “get it” and invest more in learning about their digital customers’ behaviors, preferences, and expectations will carry a significant competitive advantage over those that figure it out later (if at all). Instead of technology becoming the solution, it instead represents an enabler to do something greater. In the end, change happens to us or because of us. It takes people like you to lead transformation while everyone else reacts to it.